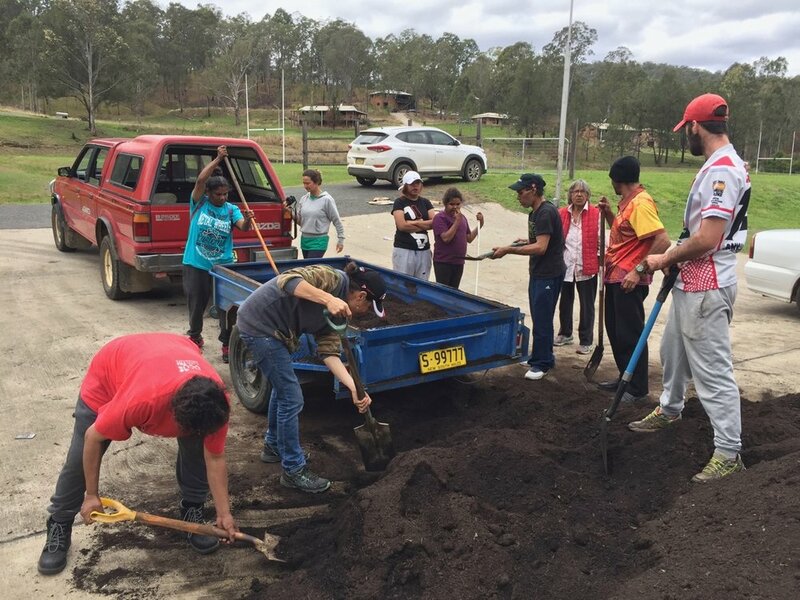 From August to October in 2018, the Compost Central team travelled out to the remote indigenous community of Malabugilmah, to work with members of the community building garden beds and compost systems to give the residents a means of growing their own food and managing their own food waste on site. 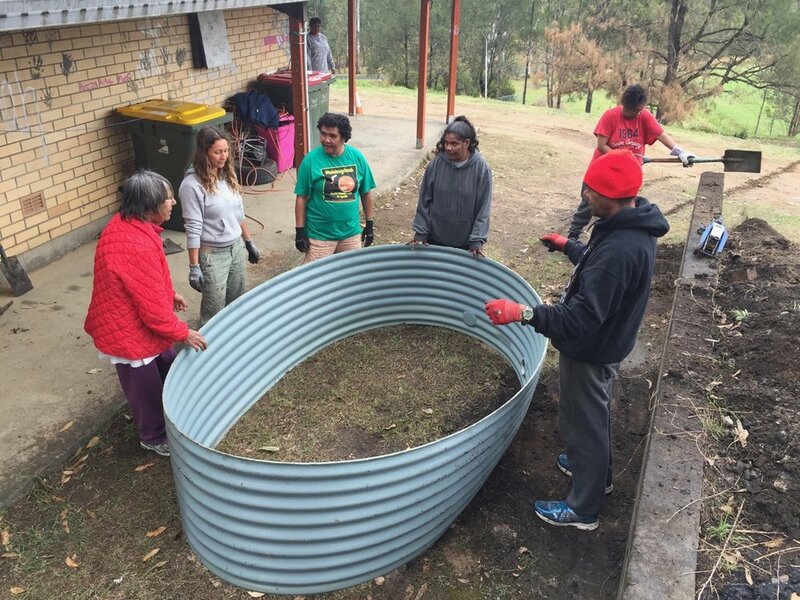 The Malabugilmah compost project is a part of the communities rubbish management plan, aiming to reduce waste to landfill by increasing organic recycling. 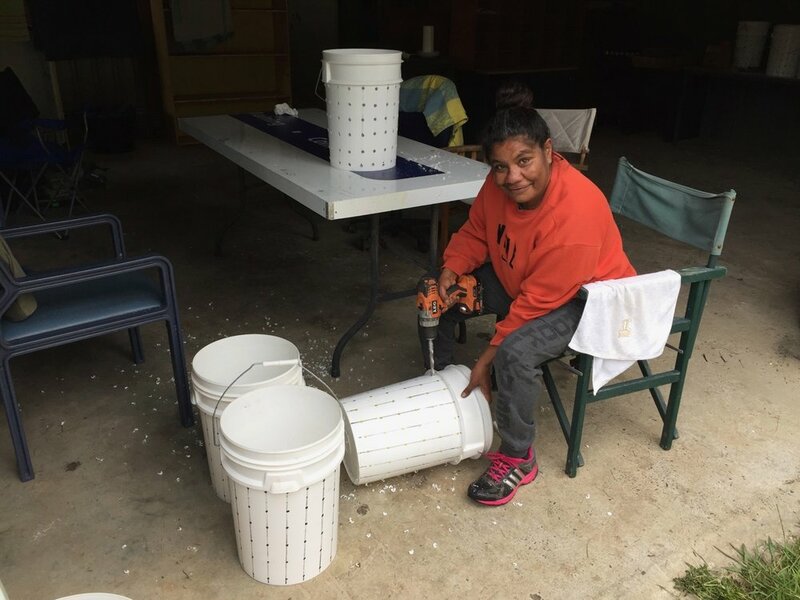 The project is one of 29 projects in Aboriginal communities across NSW funded under the NSW EPA’s Aboriginal Community Waste Management Program. Our team initially gave a presentation on converting organic waste to food to the Malabugilmah community, during a waste program with Elaine Toogood (N.E. Waste), Keith Bolton and Ross James (CEO of Jana Ngalee Aboriginal Land Council). The community was very enthusiastic and soon after the Compost Central team headed back with materials and produce, ready to assemble raised custom garden beds with composting systems. Using up-cycled materials - an old boat, a busted wading pool, a cracked water tank, a number of duraplas tanks - we created 7 raised garden beds.  Key to the project was community engagement. 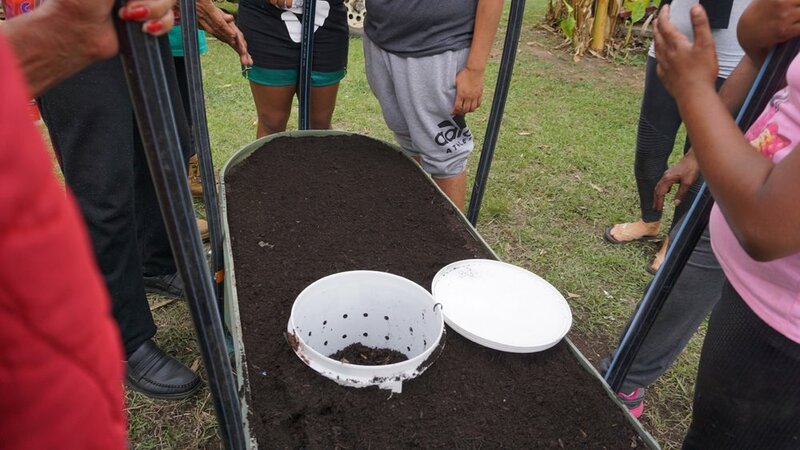 Everyone, including the children, learned in workshops: how to make compost buckets, build garden beds and plant vegetables. .Auntie Carol, an elder of the community, was proud of the community coming together to complete this project, exclaiming that she “had not seen this type of community engagement in over 20 years”. Another part of engaging the community was a presentation for the kids at the local primary school where Andrew taught the importance building up the soil and composting giving answers to one child’s innocent, yet key question “what’s so special about soil?”. On our several trips back to the Malabugilmah community, weeks after the installs, the garden beds were thriving with produce, and it was very evident that the community had taken a genuine sense of pride in their garden beds, and were making the connection between growing food and composting their waste. Malabugilmah is a small New South Wales unbounded locality within the local government area of Clarence Valley, around 3hrs from Byron Bay and 8hrs from Sydney. This project is supported by the NSW EPA Waste Less Recycle More initiative. Cliffy & Roseanne Williams. Cliffy is an Elder in the community and requested to not have any photos taken. 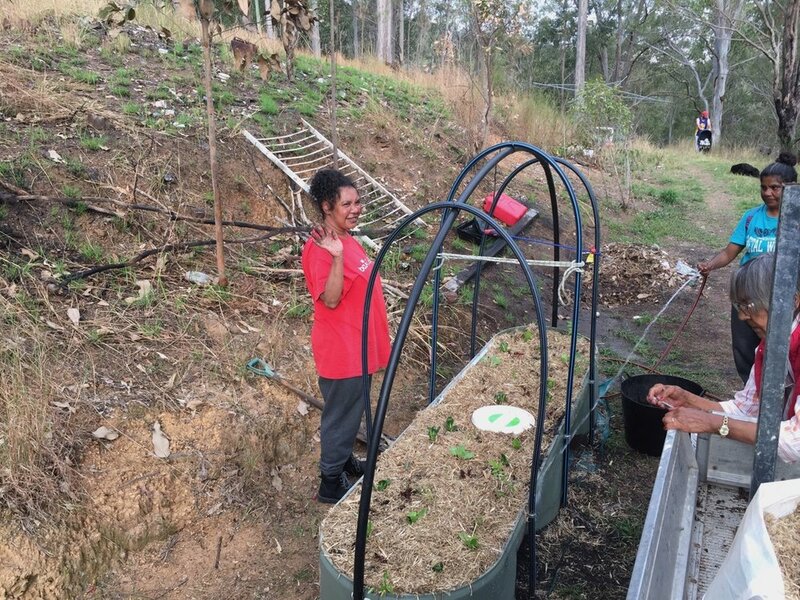 We upcycled a rain water tank into a fully functioning Gardenship veggie and herb garden with compost bucket system. Elaine Toogood from North East Waste sharing about the Malabugilmah project, in collaboration with Compost Central. A great success! And it’s only just begun! A few extra photos of the whole team (Compost Central and Mala community locals) working hard and learning together, whilst constructing the gardens. A great community effort!